Which is the best projector for you? Welcome to our list of the best portable projectors money can buy in 2019. These top picks allow you to easily carry around a projector so you can quickly set it up and use it while you're travelling. The best portable projectors are perfect for professionals who are often travelling for work, as it means you can conduct presentations quickly and easily using your own equipment – rather than having to fiddle around with cables in front of an audience. They can also be used for entertainment as well, giving you an impressively large screen to watch movies or play games on. So, what should you look out for when buying the best portable projector for your needs? For a start, you should make sure the portable projector has all the connectivity options you require. Most should have HDMI, which will let you plug in almost any device into it, though some will have a mini HDMI port, so you'll need a special cable. 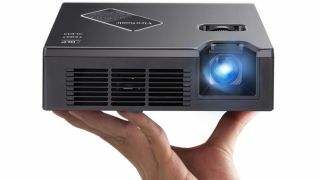 Meanwhile, other portable projectors have a simple USB output, which allows you to connect laptops and other compatible devices to it. There are also some brilliant portable projectors that offer wireless connectivity, which makes broadcasting from your smartphone or tablet easy. The best portable projectors also have batteries, which makes them easy to place for optimum image quality. However, there are some that still need to be plugged into a power supply, so bear that in mind when choosing the best portable projector for your needs. You should also check to see if a portable projector has built-in speakers. If it does, it means that's one less thing to carry around with you, but don't go expecting cinema-like sound quality from those small speakers. Also, make a note of maximum screen size and resolution. Many portable projectors can project large images, especially considering their small size. As well as listing the best portable projectors, we also have our very own price comparison tool that will help you find the best prices as well. The Philips PicoPix PPX4010 is impressively small, even by portable projector standards. It's so small, that you wonder what use case demands it be that small, aside from it being able to easily fit into a your briefcase, or even a jacket pocket. It features an easy setup and is able to project content only drawing power via USB. The Philips PicoPix PPX4010 has a 100 lumens brightness, which means it doesn't have to be used in pitch black conditions to see. The ML750e by Optoma is a lot more powerful than the pocket-sized PicoPix from Phillips, but it's not quite as small. Still, it weighs just 380g with a small footprint that makes this easy to carry around. The differences in size between this and the PicoPix are negligible for the power you get in return: a 700 Lumens lamp that lets you present in rooms that aren't completely darkened. The Optoma ML750e is one of the best portable projectors in the world thanks to its impressive range of ports. It comes with one MHL-ready HDMI input, a USB 2.0 slot for thumbdrives, a universal I/O slot, and a microSD card slot. The ML550 handled our 90-inch test screen with impressive results, and peaked at a 60-inch-or-so size. However, you need to buy a dongle for Wi-Fi access. Usually when you choose a portable business projector you have to make a few sacrifices in order to have such a small device – but that's not the case with the Epson EB-S41. Its 3,300 lumen brightness is much brighter than many other portable projectors, and means you have more flexibility when setting up the EB-S31 in environments where there is still ambient light. The EB-S41 is small and light enough to carry around with you on business trips, but it also has a very large projection size – up to 300 inches – which makes this an incredibly versatile portable business projector. The LG Minibeam PH550G is a brilliant portable projector that's ideal people who often work on the road thanks to its compact size. It's also wireless as well, allowing you to connect a smartphone or tablet to it, and showcase your presentations or media quickly and easily. This is great for impromptu meetings, and despite its small stature, it offers brilliant image and sound quality. The Asus ZenBeam E1 is a beautifully designed pocket projector that's small and light enough to carry around with you if you often make presentations on the road - or if you like to watch movies while travelling. Despite its small size, it can project images up to 120 inches in size, and it has a built-in 6,000mAh battery that can power the projector for up to 5 hours, which makes it rather flexible, as you don't have to worry about finding a plug socket to power the device. In a rather nice touch, the projector can also double as a power bank for other mobile devices. The Asus ZenBeam E1 isn't the most powerful portable projector, but its versatility, ease of setup and eye catching design gives it a place on our list of best business projectors. The ViewSonic PLED-W800 is an excellent performer and one of the best portable projectors money can buy, weighing in at 830g and measuring 175 x 138 x 51.5mm (W x D x H). With a lamp that can reach up to 800 lumens, you can still run a presentation in whatever room you can bring it to, provided you can shade the windows and lower the lighting. It comes with an SD Card slot, a USB slot, an MHL-ready HDMI input (for connecting DVD/Blu-ray players and also smartphones/tablets) and a VGA input for laptops.